Candy Coated Life: Home Again Home Again! I feel so bad that I've become a once a month blogger! I finally did make it home from Cheyenne, Wyoming only to almost immediately have to leave for Victoria, B.C. with my mother-in-law. Of course, keeping up with my title of "worst blogger ever" I took no pictures while I was there. Obviously I need to go back again so I can get those pictures! To be honest though, I've been so burned out on traveling, I've become a complete homebody. That means I've been able to catch up on all my wife-chorse as well as get started on some projects around the house. I've started some seeds for a vegetable garden, and they should be ready to be planted outside soon! I'm looking forward to homegrown veggies to go along with the raspberies we already have. I'm also in the middle of replacing our pocket doors in the kitchen (which I had no idea would be so complicated). Of course being a homebody means also spending a bit too much time online... So here's my list of "Distracting Things On The Internet"! First of all, I'm in love with this series on YouTube, Gatonovela. Cats + Hispanic soap operas = LOVE! (which is HERE by the way! 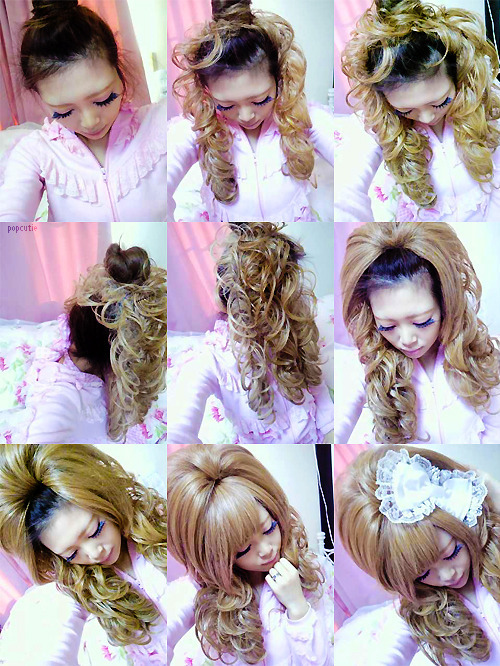 Let's all have beautiful crazy hime hair!) Sometimes I get really upset when people don't meticulously source things, but then I realized I would be spending way too much money shopping. I've also been putting together care packages! Birthday presents, things to be returned to Maryland and a very very special package for Violet from VioletLeBeaux.com! I am so in love with the video she did of opening it! Also a note about my shop on Etsy, it's on hold while I wait for my sewing machine to be serviced. If you have any questions in the meantime though, please feel free to ask in the comments!